On every achievement/rank edit screen you will see a new meta box where you can configure an access price to let your users get this achievement/rank without complete the requirements. 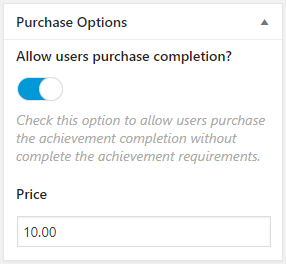 You can display an achievement purchase form using [gamipress_achievement_purchase] shortcode and GamiPress: Achievement Purchase Form widget. Also, You can display a rank purchase form using [gamipress_rank_purchase] shortcode and GamiPress: Rank Purchase Form widget. If user has previously earned the achievement or is in a higher rank, then the purchase form not will be shown.